Fast Track Backup is an easy-to-use tool that allows you to backup your data. FastTrack Backup provides high performance backup, copies files and folders from one location to another on the same drive, another drive, ftp server or across the network, FastTrack Backup supports writing to Floppy, Zip, Jaz, CDR, CDRW, DVD-R, DVD+R, DVD-RW or DVD+RW compatible media, has the ability to back up exclusively opened files. FastTrack Backup can either mirror your data "as is" or create archived zip files (gzip compatible). You can set up projects that describe the source location, the destination location, and the frequency at which you want to backup the files. 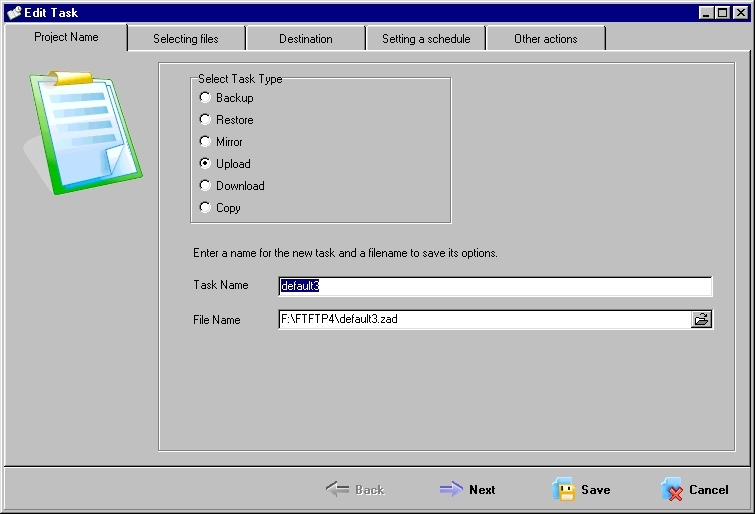 FastTrack Backup key features multiple connections, incremental backup. backup with timestamps and versions, can run other programs before/after executing your backup, advanced log files and more. Fast Track Backup supports Proxy, Firewall, Sockets 4, 4.5, 5, SSL (FTPS), Secure FTP (SFTP provides safe authorization using password or public-key based authentication), SSH (Secure Shell) - integrity and privacy of data transfer using SSH protocols. Designed to easily solve your data backup problems. The reliable and affordable backup solution. Fast, reliable and affordable backups with a couple of unique features. Qweas is providing links to FastTrack Backup 3.0 as a courtesy, and makes no representations regarding FastTrack Backup or any other applications or any information related thereto. Any questions, complaints or claims regarding this application FastTrack Backup 3.0 must be directed to the appropriate software vendor. You may click the publisher link of FastTrack Backup on the top of this page to get more details about the vendor.